The thinnest all-in-one electronics package available today at only 1-1/2â thick. 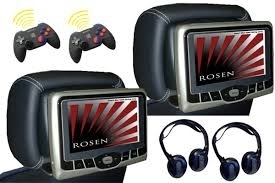 Featuring integrated 7.0â LCD display, DVD/CD/MP3 drive, 25 video games with wireless game controller, USB port for flashdrive media devices, auxiliary input for external sources, full system controls, 2-way up-down tilt, all-channel FM transmitter to play audio through the vehicles sound system and the ability to add front seat remote controls for each screen, a second auxiliary input for video game consoles, outputs for 2 additional screens and more. They mounts to the seat post guides or to the headrest posts and allow the vehicles Active Head Restraint systems to function as designed for ultimate front seat occupant safety in the event of a rear impact collision. Whilst designed for Mercedes and BMW applications that use a true âActive Head Restraint Systemâ, the AV7700 can be installed in to almost all cars.. The back cover of each electronics pod is trimmed to match the vehicles interior. Available with either black or silver bezels.